Cut acorn squash in quarters. Remove seeds. Place the squash pieces in a shallow oven proof pan with a cut side down. Add about a 1/4 inch of water. Cover the baking dish with foil. Bake the squash for 30 - 35 minutes or until yellow flesh can be pierced with a knife. Remove from the oven, cool slightly. While the squash is baking, melt the Earth Balance in a small pan, add the vegetable broth and onions and saute for about 10 minutes or until translucent. Remove from heat and reserve. Increase oven heat to 425 degrees. When the squash is cooked, remove the yellow part of the squash to a mixing bowl, leaving about 1/4 of an inch of the squash on the green rind. Place the shell of the squash in the baking dish, rind side down after removing water from pan. Mash the squash with a fork until it is just "chunky". Add the sauteed onions, crushed pineapple, salt, cinnamon, maple syrup, and bread crumbs. Mix well. Fill the shells with the squash mixture divided evenly. Sprinkle additional bread crumbs on stuffing. Spray a little canola oil on bread crumbs (optional). 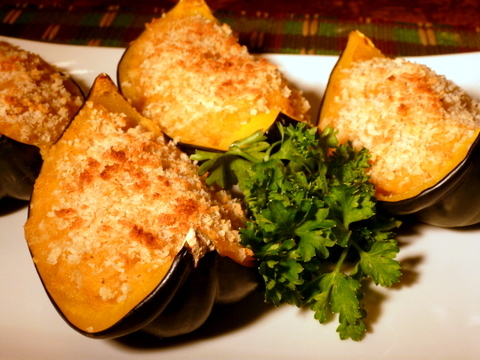 Placed stuffed squash in the oven for about 15 minutes or until bread crumbs have turned a nice brown color. Serve warm.